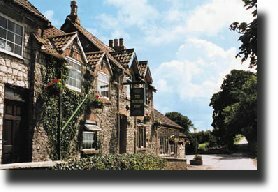 The Hunters Rest Inn was originally built around 1750 as a hunting lodge for The Earl of Warwick. The Earl picked his site perfectly, set in beautiful countryside high on Clutton Hill with commanding views over the Cam Valley to the Mendip Hills, and over The Chew Valley to the port of Bristol. In 1892 The Earl sold his vast estate in Somerset, the former lodge became a smallholding and tavern supplying refreshment to the growing coal mining community. Over the years mining died out but the small Inn evolved to become one of the most popular in the area. Conveniently located for Bath, Bristol and Wells, this privately owned free house is renowned for its homemade food, well stocked cellar and warm welcome. In Winter log fires crackle in the hearths while in Summer our landscaped gardens are ideal for a cooling drink as you watch our miniature railway carry passengers around the gardens. The Hunters Rest successfully combines the character and atmosphere of a delightful country Inn with the high standards and ameneties expected by todays guests. With the recent conversion of the first floor, we have created four luxury, en-suite rooms; each individually designed and decorated. Furnished to the highest standards our rooms include: a four poster suite, antique furniture, stunning bathrooms, direct dial telephones with data links, colour televisions and videos and all have magnificent views, two with their own balconies. The Hunters Rest Inn is the perfect base for discerning business people who are tired of faceless hotels or visitors seeking a relaxing stay in a traditional English Inn, surrounded by beautiful countryside. Poachers Restaurant at The Hunters Rest is the ideal venue for family celebrations, weddings, club events and works get-togethers; catering for parties of up to 70 with a superb choice of menus. This privately owned free house is renowned for its homemade food, well stocked cellar and warm welcome. In Winter log fires crackle in the hearths while in Summer our landscaped gardens are ideal for a cooling drink as you watch our miniature railway carry passengers around the gardens.